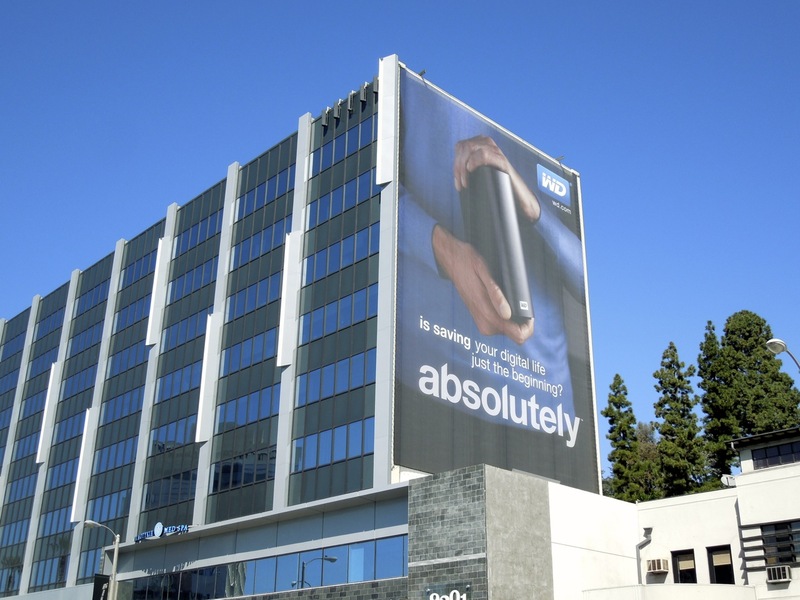 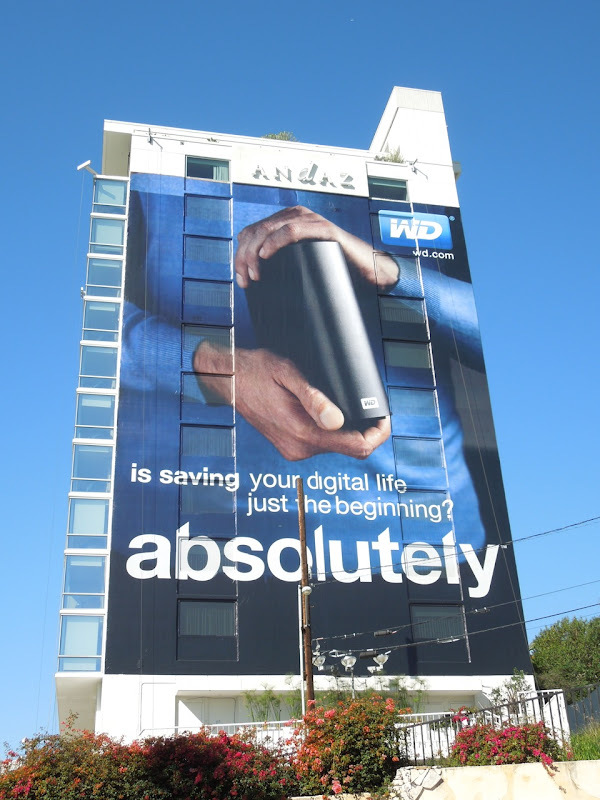 Daily Billboard has mixed feelings about this 'absolutely' billboard campaign for WD (Western Digital). 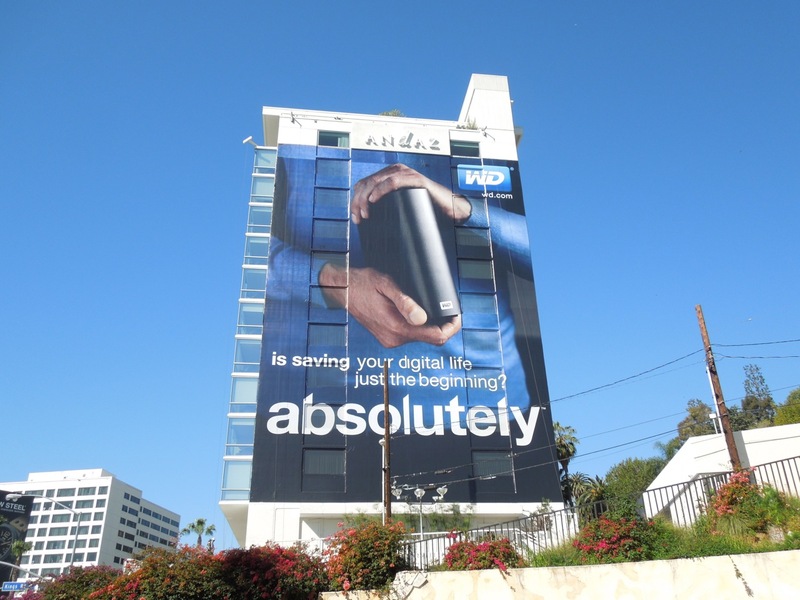 Yes, they are everywhere around L.A. at the moment and have several prime super-sized locations along busy commuter routes covered, but the creative is just a little bit dull don't you think? 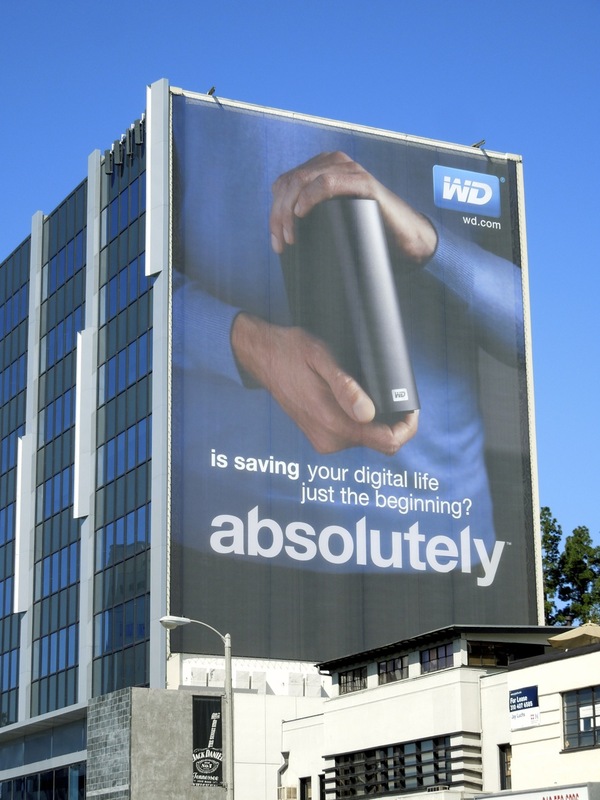 Sure it's hard when you're selling a piece of tech which looks like a black box, but even though they've tried a softer lifestyle approach, these ads are still a little corporate looking. 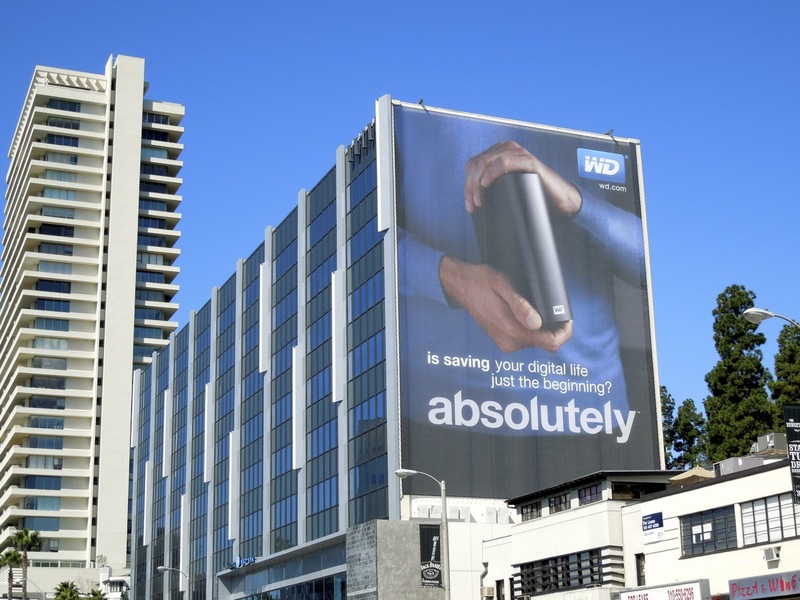 In the campaign's favour it does look consistent across sizes and formats, and the 'absolutely' headline does catch your eye. 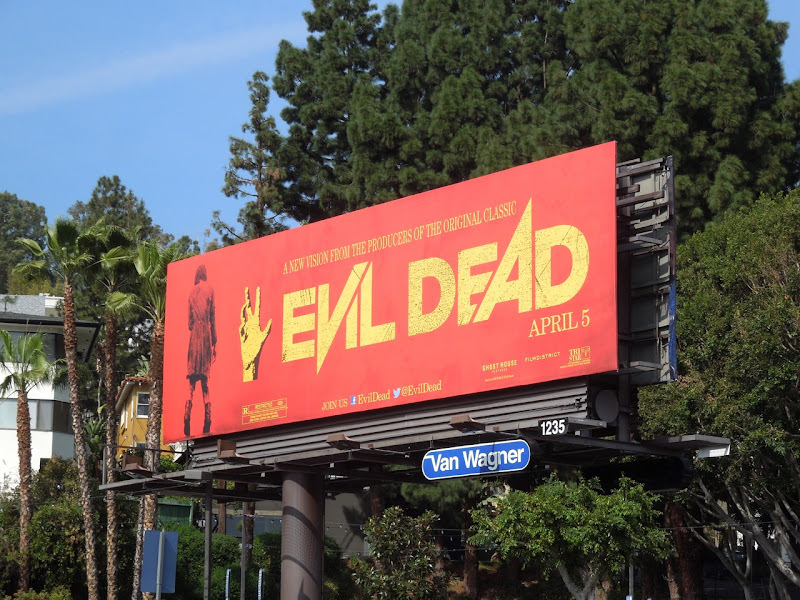 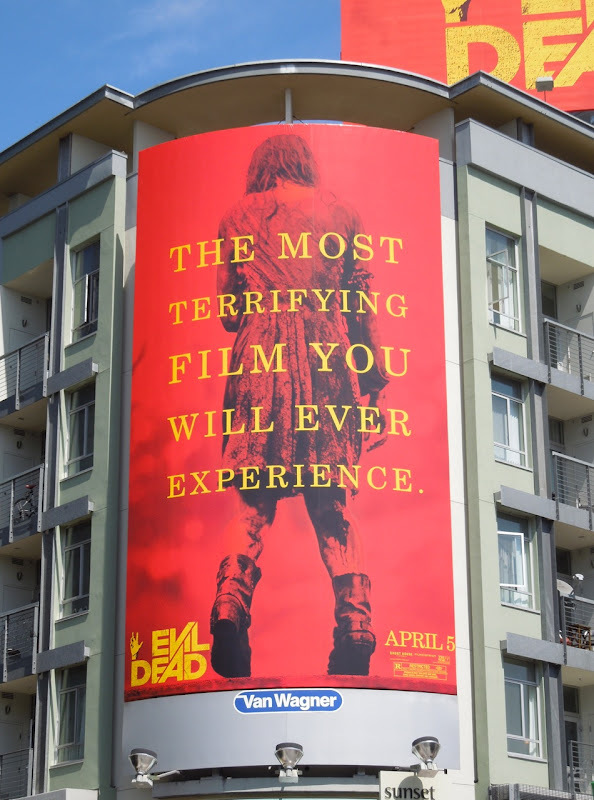 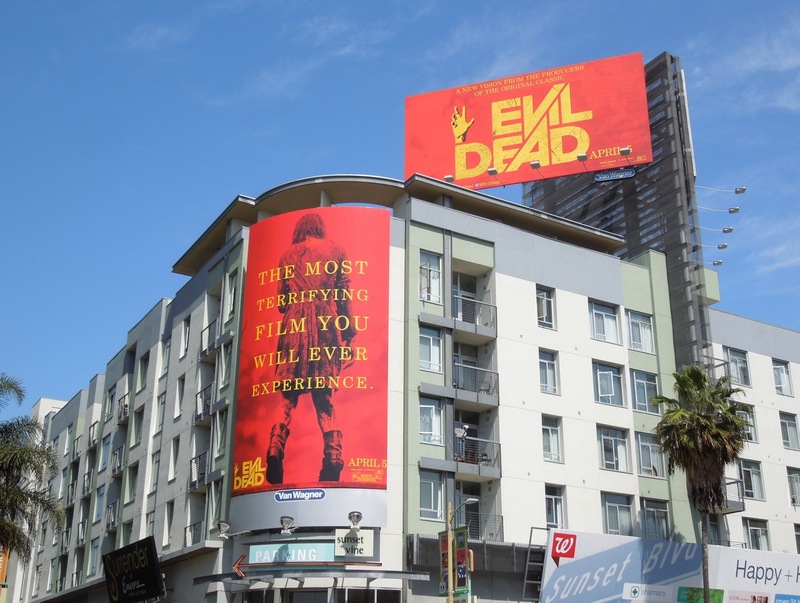 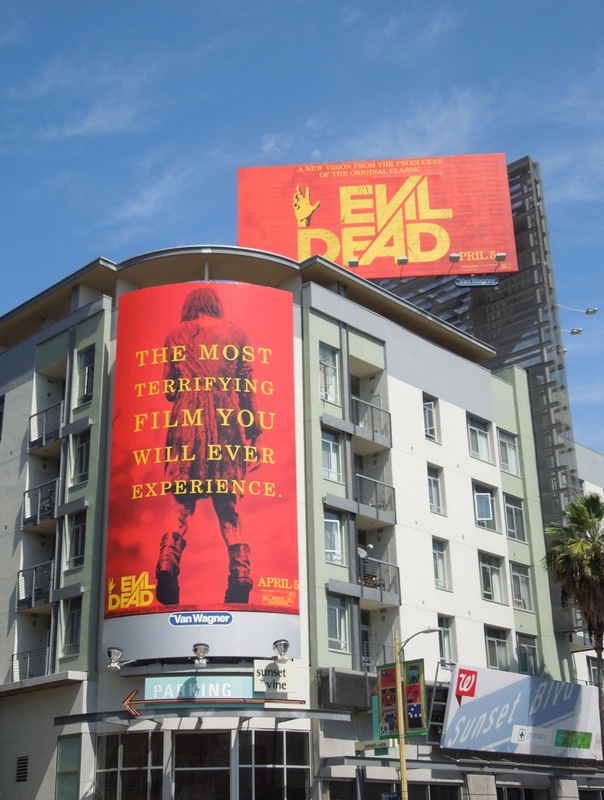 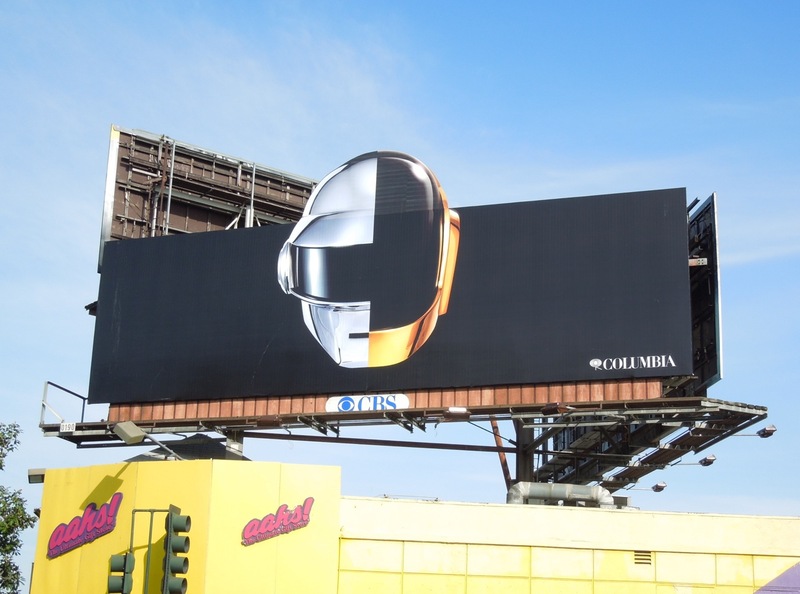 The impactful giant-sized billboards were snapped in two locations along Sunset Boulevard, whilst the other landscape and portrait creative were spied around the Hollywood & Highland Center, from March 9 to March 14, 2013. 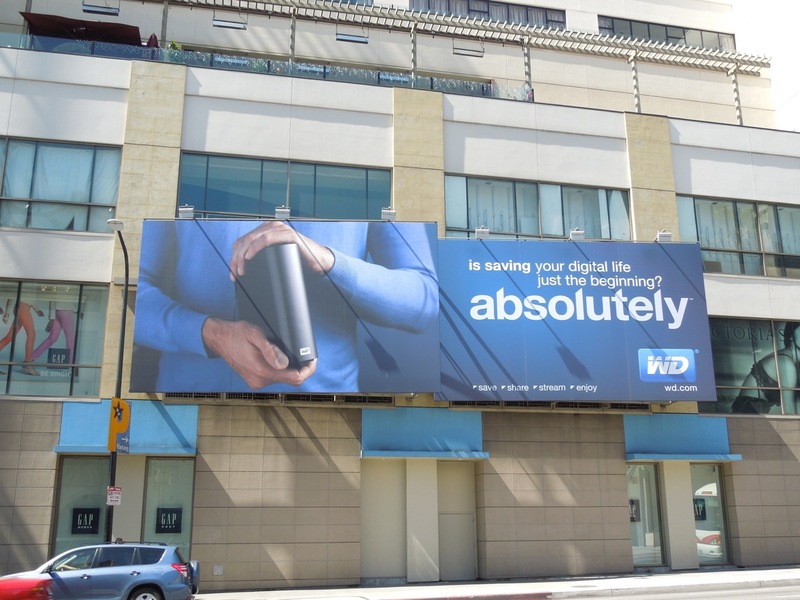 For another approach to advertise a little black box of technology to consumers, check out these fun Roku Keep Streaming America billboards which use copy and typefaces in a clever way. 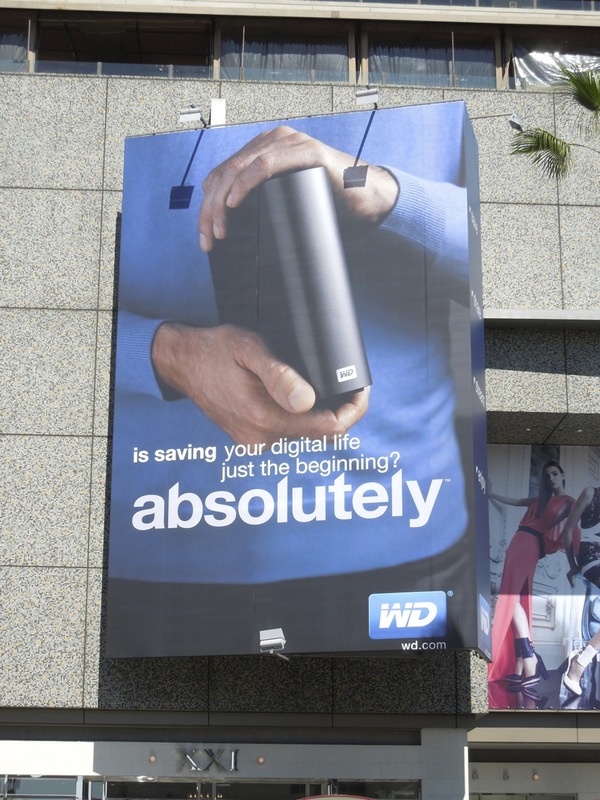 What do you think about the design of these WD ads? 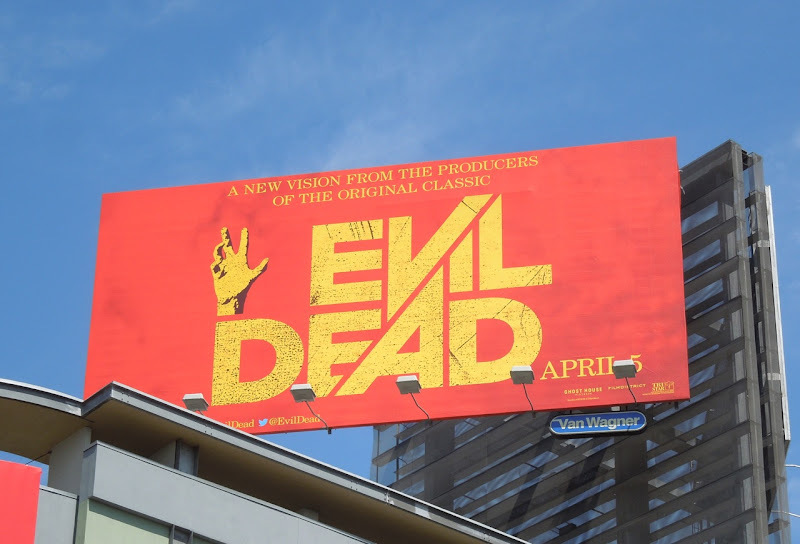 Post a comment and have your say. 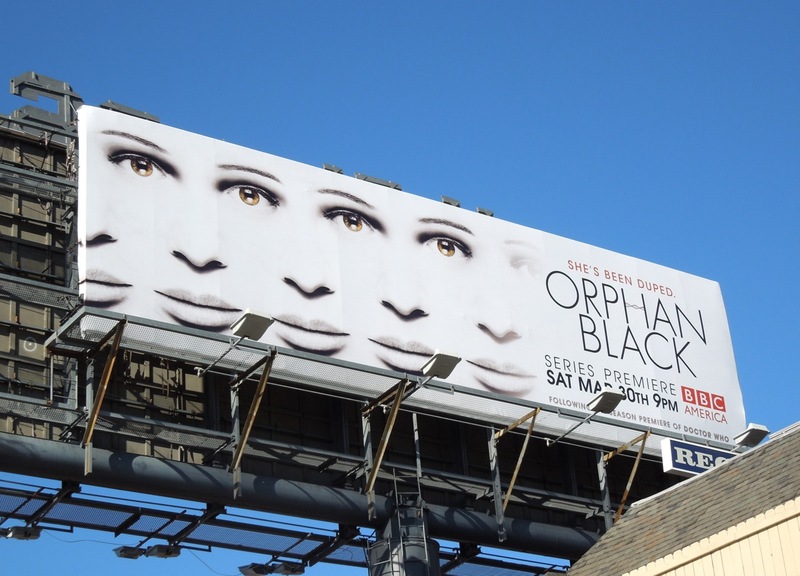 If Doctor Who doesn't satisfy your craving for the unusual, it looks like BBC America has another slice of sci-fi to keep you entertained in the form of the mysterious new clone drama, Orphan Black. 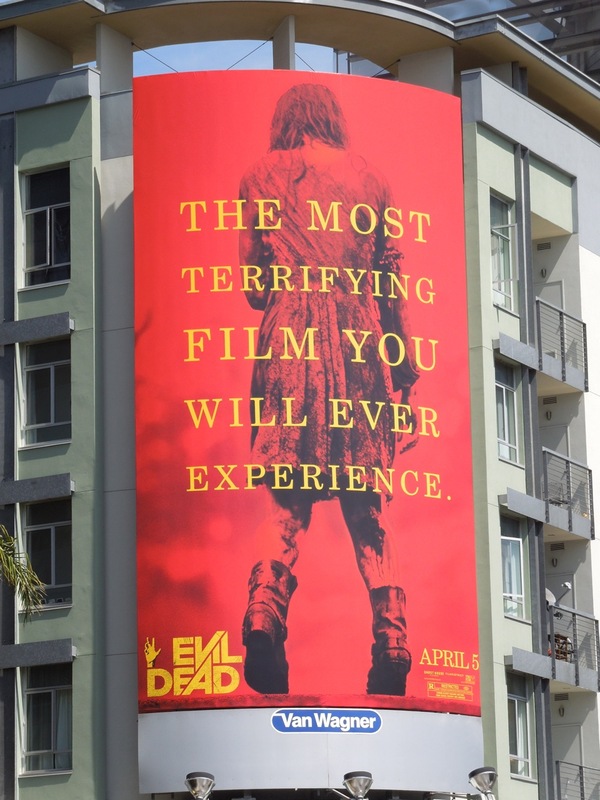 This ad creative for the new series has a pretty hypnotic and unsettling quality to it and certainly fits with the show's tagline 'She's been duped'. 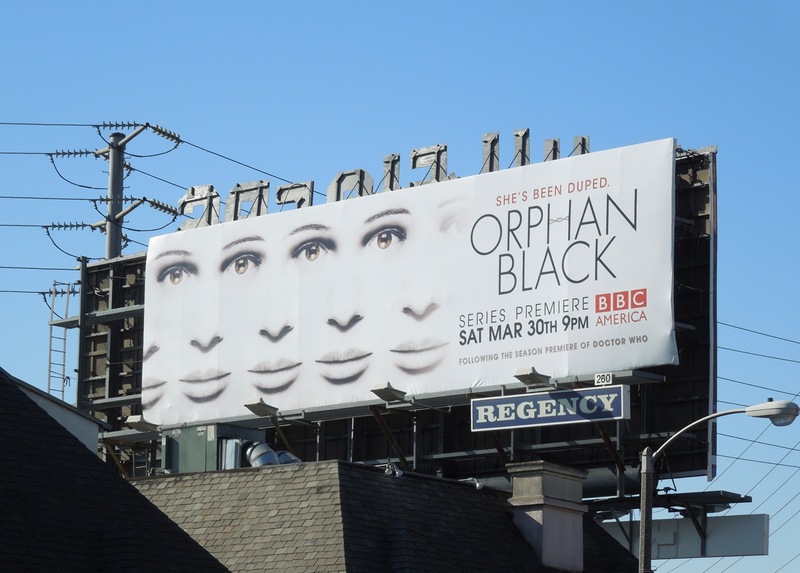 Tatiana Maslany stars as 'Sarah', an outsider and orphan, who discovers there's more than one of her wandering around with her face and they are all involved in deadly conspiracy. 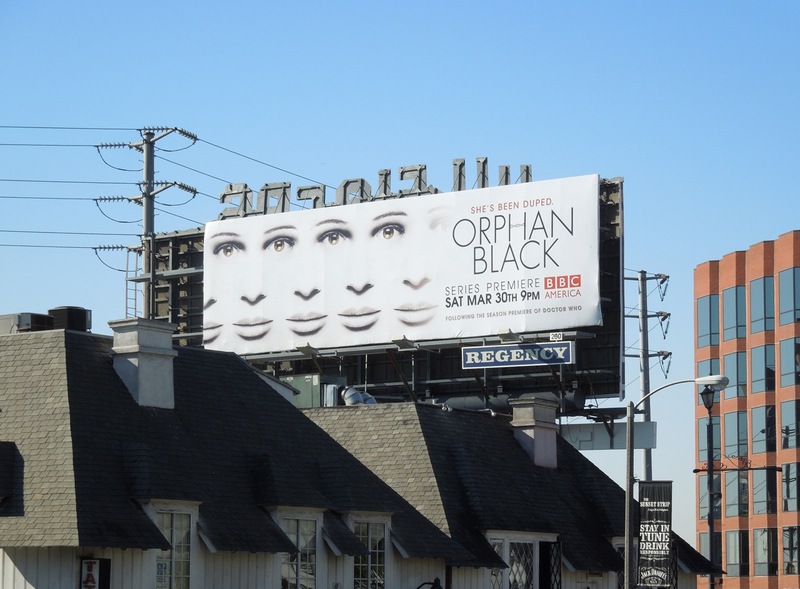 This series premiere billboard for Orphan Black was spied along L.A.'s Sunset Strip on March 12, 2013. 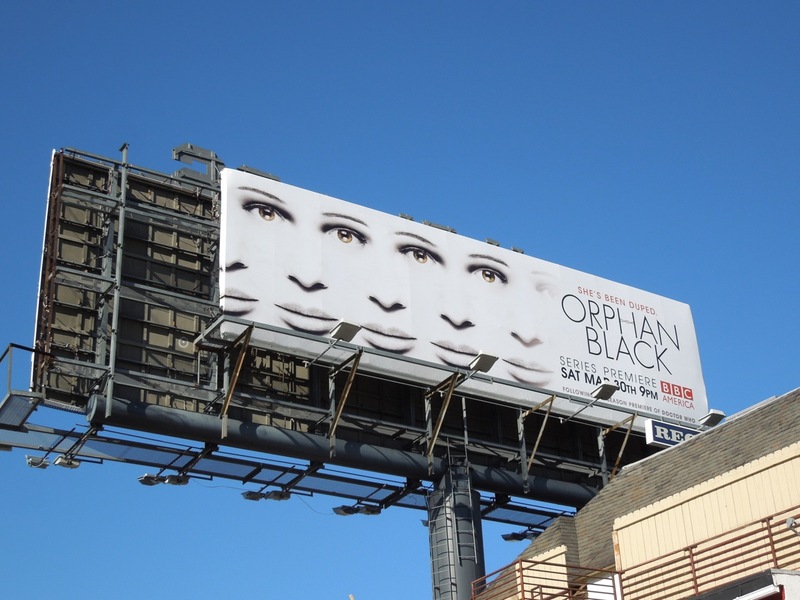 If you're a fan of the TV network, be sure to check out these other BBC America series billboards here at Daily Billboard. 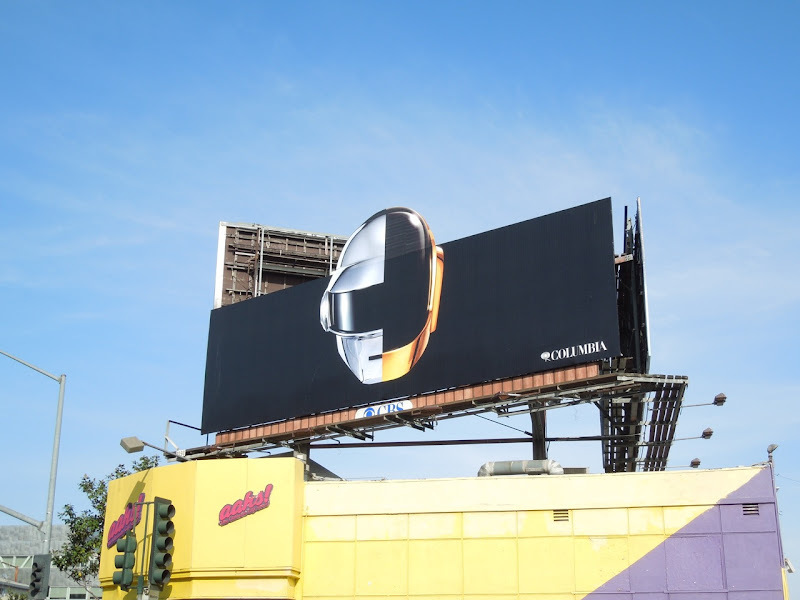 For those who know the electronic music duo and their music, this billboard creative is instantly recognisable as belonging to Daft Punk with their signature robotic style masks. 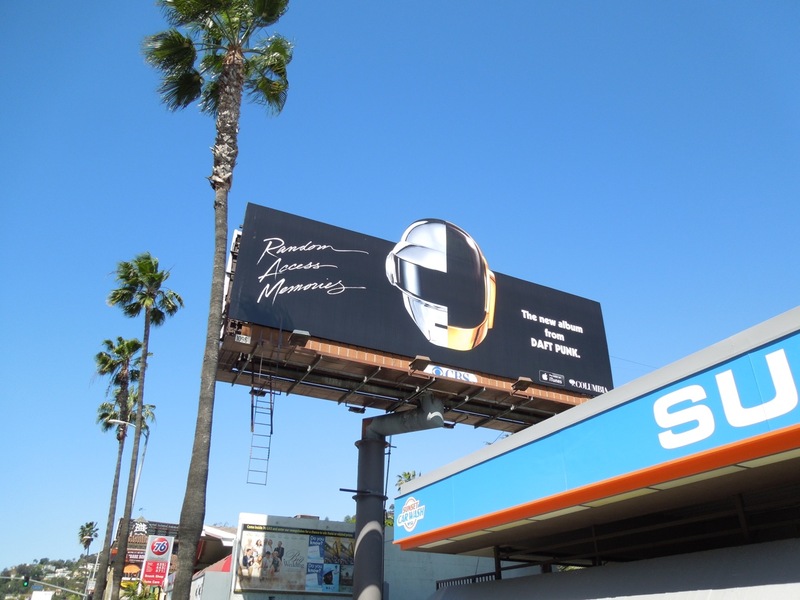 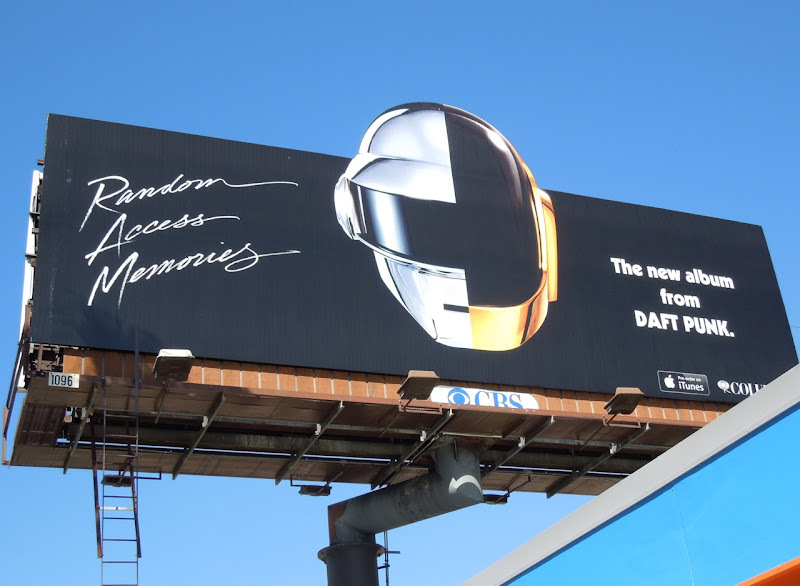 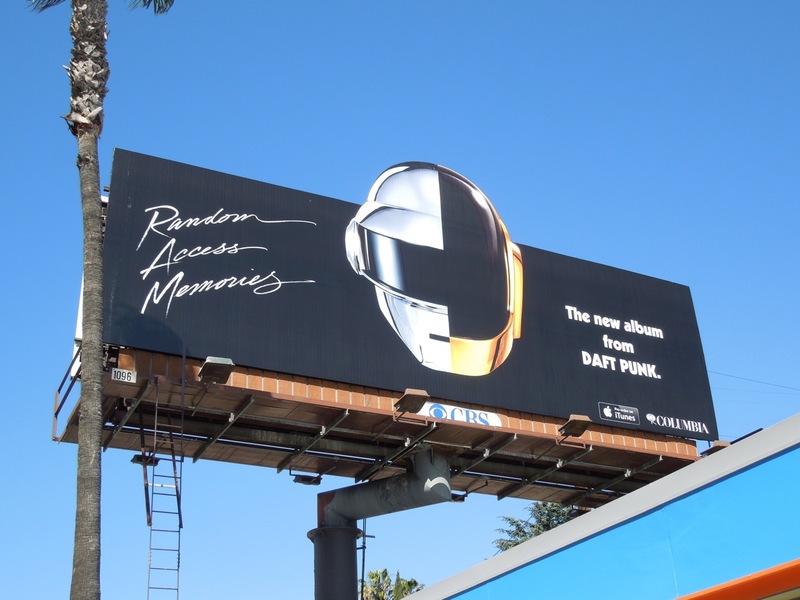 In fact this eye-catching special extension billboard is for their latest album, Random Access Memories, due to be released in May this year. 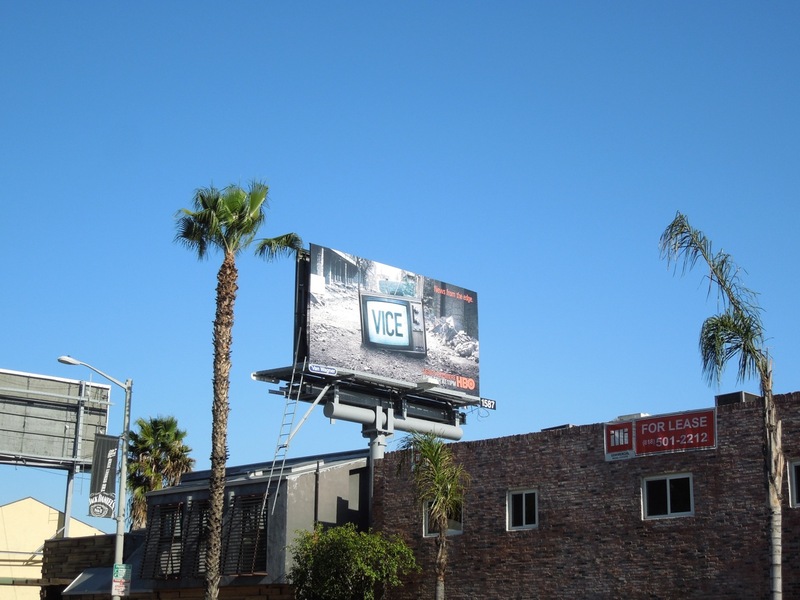 This cool billboard was snapped along Sunset Boulevard at San Vicente Boulevard opposite The Strip's infamous Whisky A Go-Go music venue on March 26, 2013. 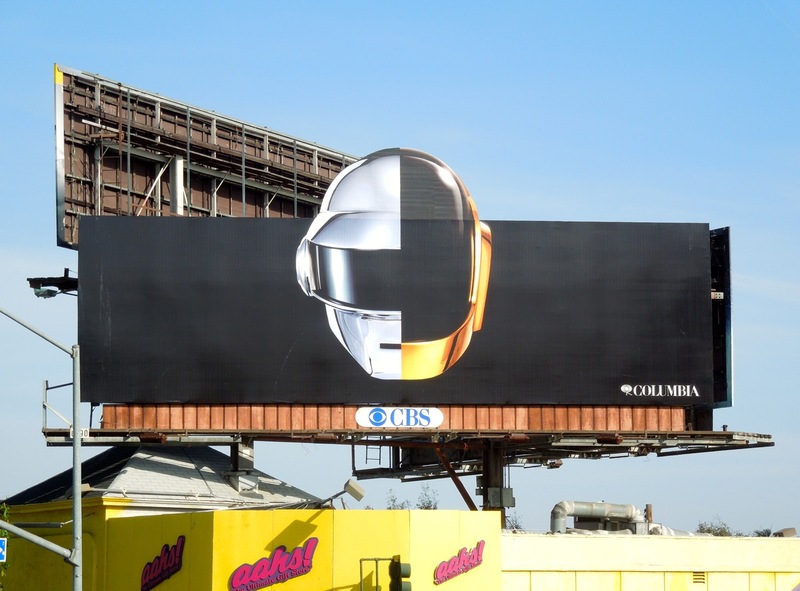 If you're a music lover, be sure to check out these other music-themed and recording artist billboards. 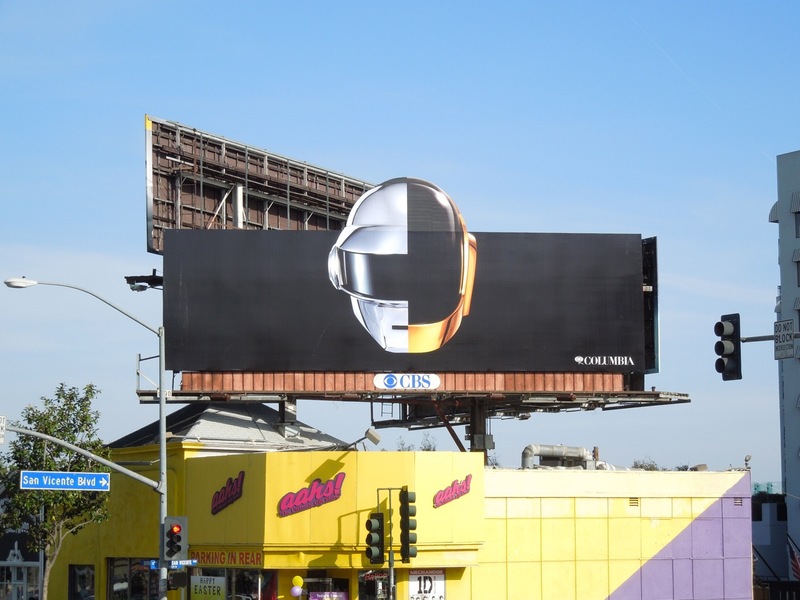 UPDATED: If you liked the enigmatic helmet tease billboard, then here's the payoff, the official album release billboard with a bit more detail for those not in the know. 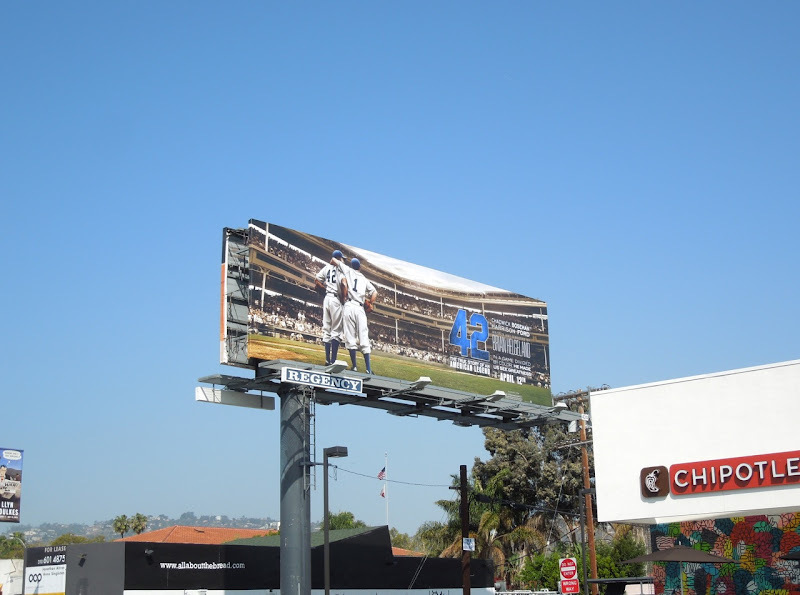 You have to agree this creative has great standout and this billboard ad was spied further east along Sunset Boulevard on April 9, 2013. 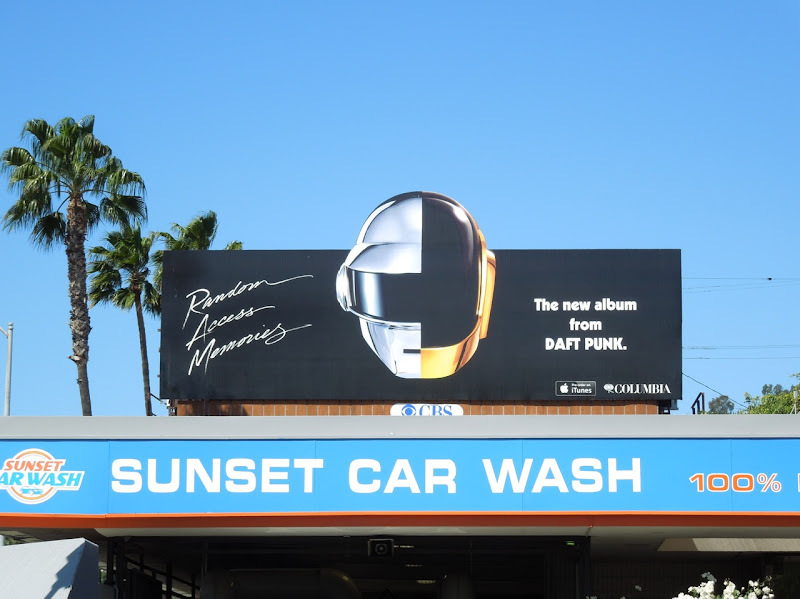 Which version do you prefer, the one with the album title and copy or without? 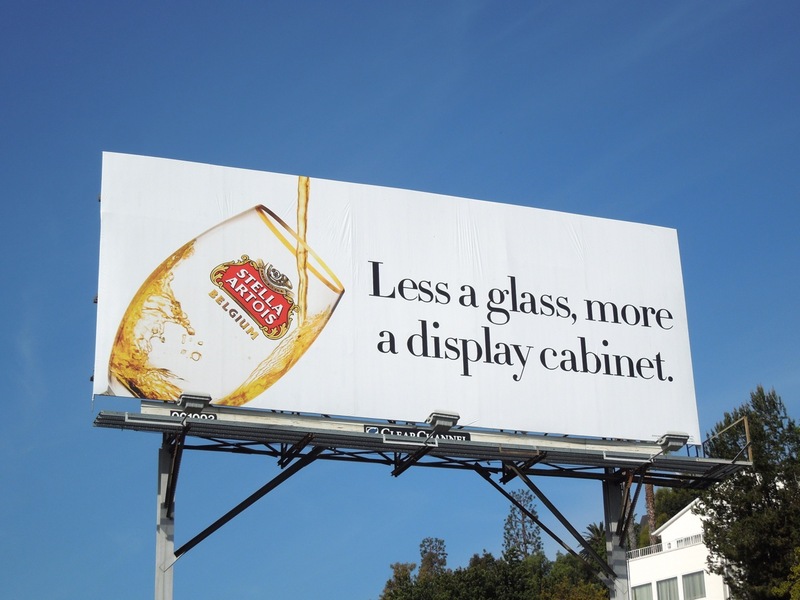 Stella Artois continues its clever and witty ad campaign perpetuating the idea that their beer is a thing of beauty that deserves to be shown off. 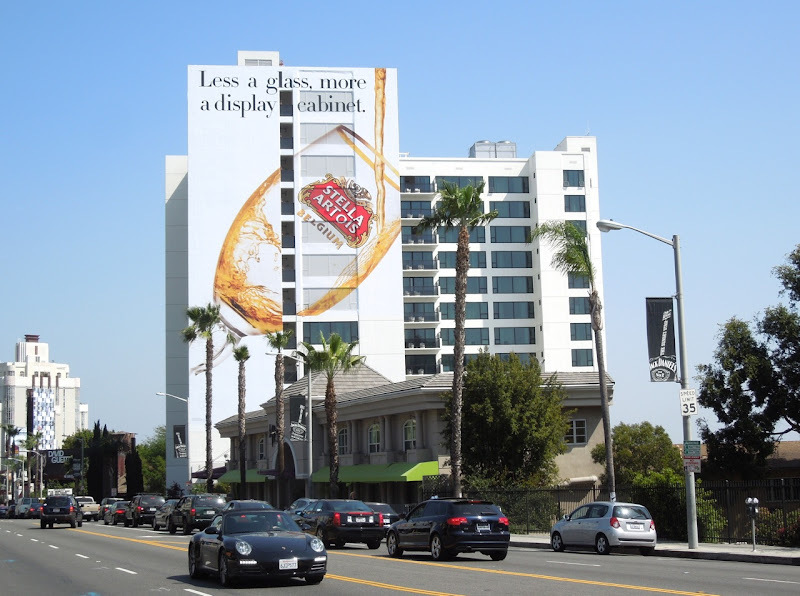 And to get their point across not only do they have a standard size billboard along L.A.'s Sunset Strip, but also a super-sized creative wrapping around the side of the swanky Mondrian Hotel for maximum impact. 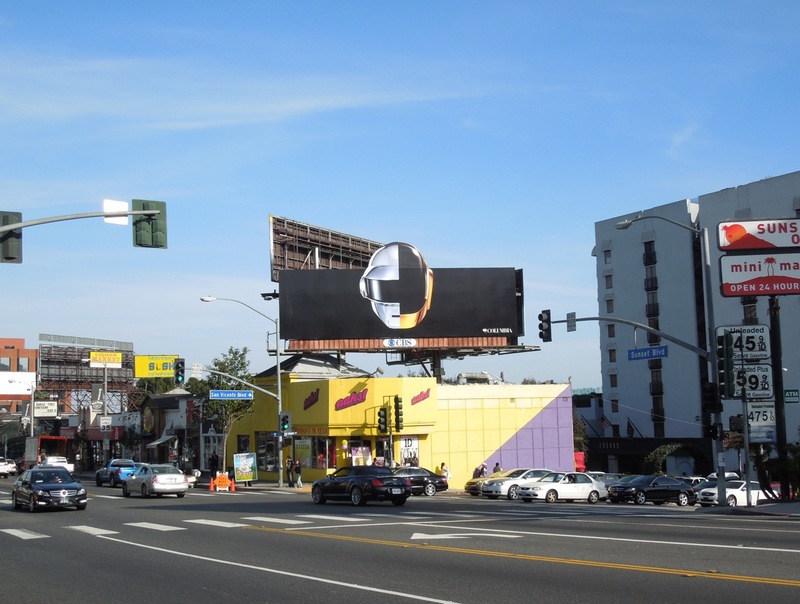 These billboards are certain to get passersby taste buds tingling, especially on a hot sunny day. 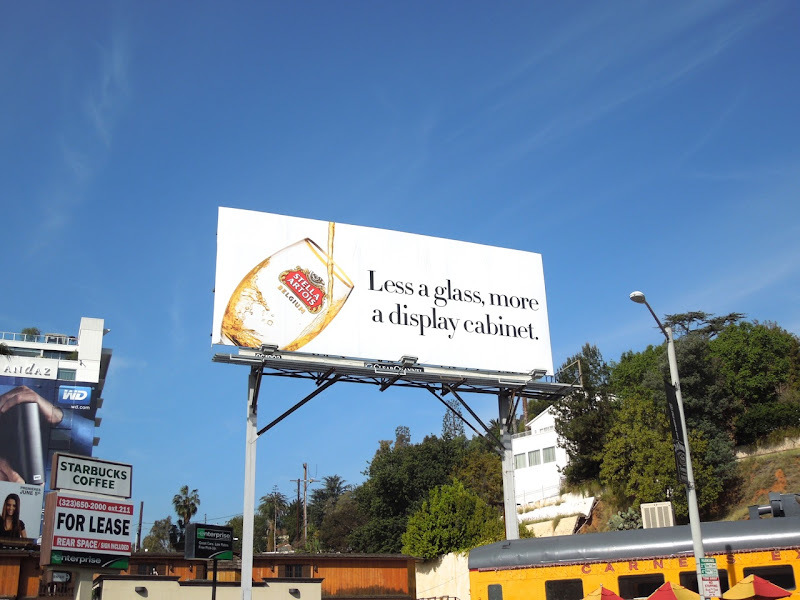 But when you do get your Stella, remember to savour every drop as the ad implies. 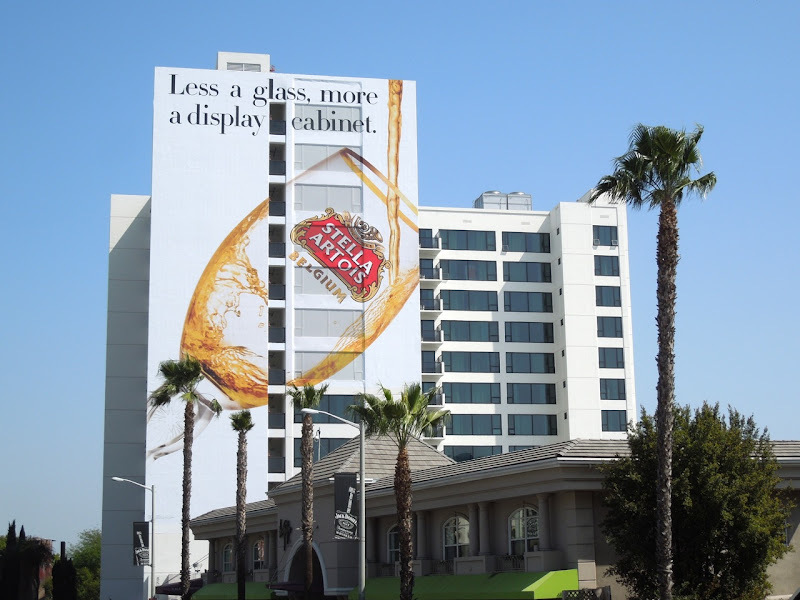 If you like this ad, be sure to take a look at these other clever Stella Artois billboards. 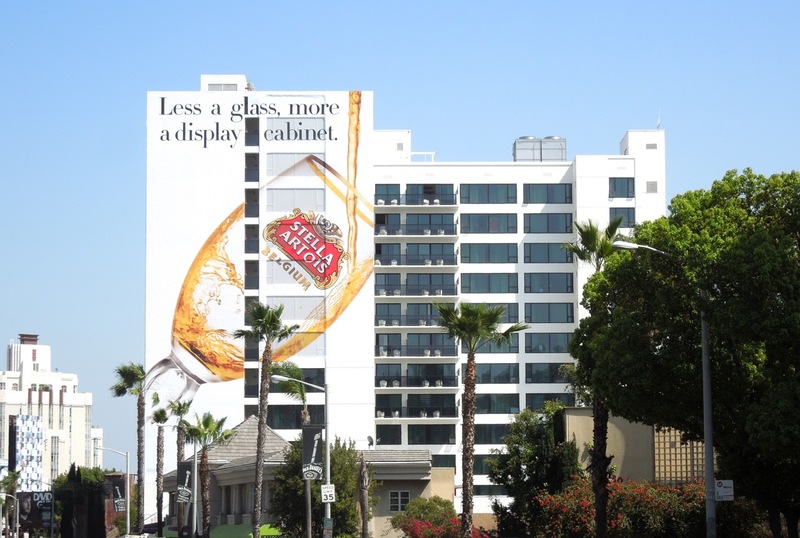 Plus if you're a beer lover, check out these other thirst quenching examples of beer advertising billboards. 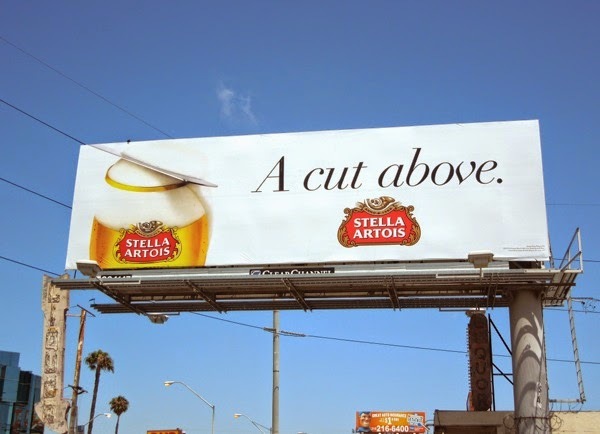 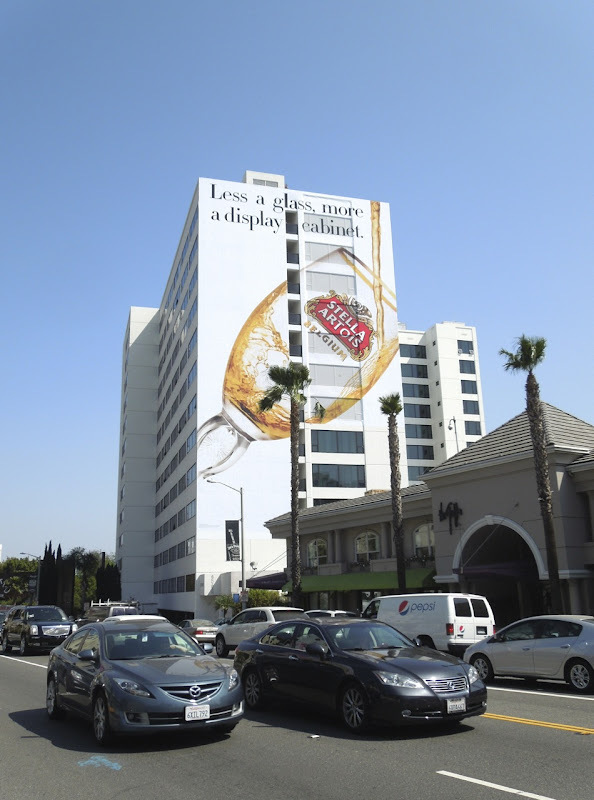 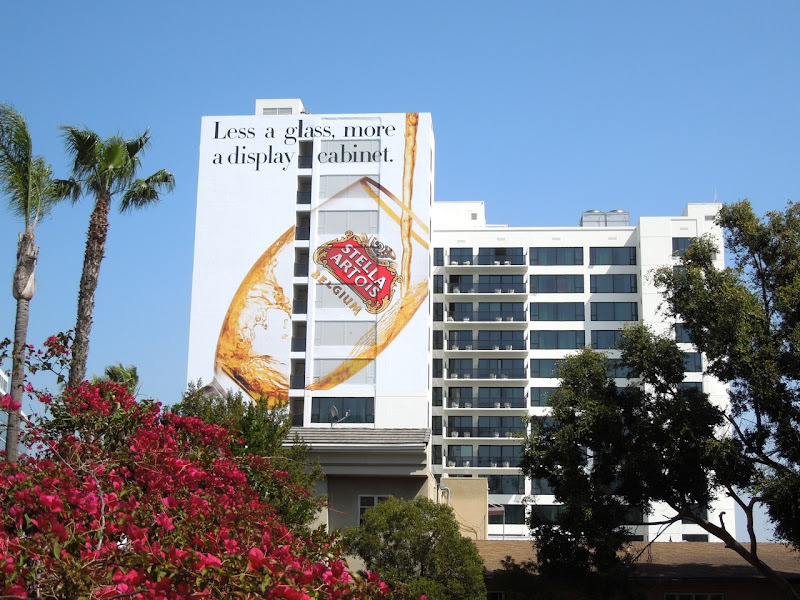 UPDATED: In addition here's the latest Stella Artois outdoor ad to grace the skies of L.A., continuing the beer's premium positioning with this 'A cut above' billboard, snapped along Century Boulevard near LAX airport on June 17, 2014. 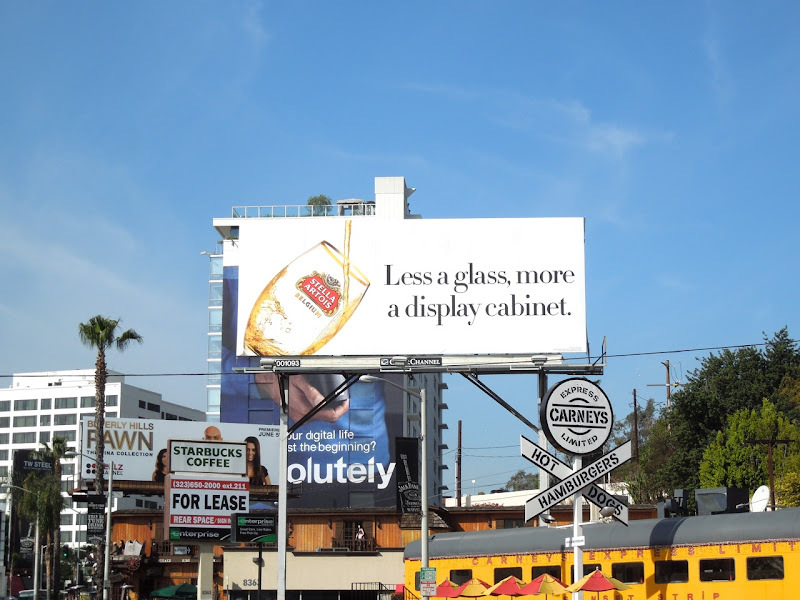 It reminds Daily Billboard of this festive Heineken beer plow ad creative from the 2011 Holidays. 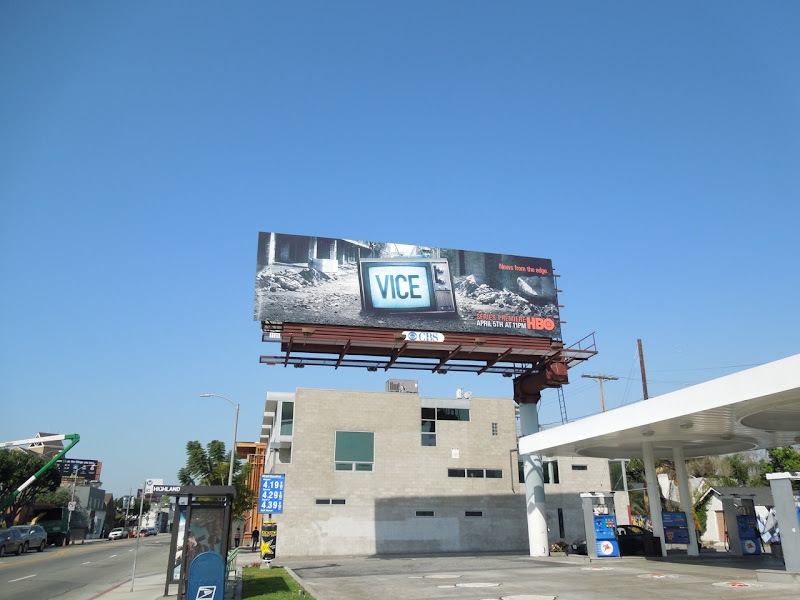 Vice is a fresh news magazine series debuting on HBO this Spring taking its name from the hipster publication and growing media empire of the same name, which promises to bring viewers startling and cutting edge stories from around the globe. 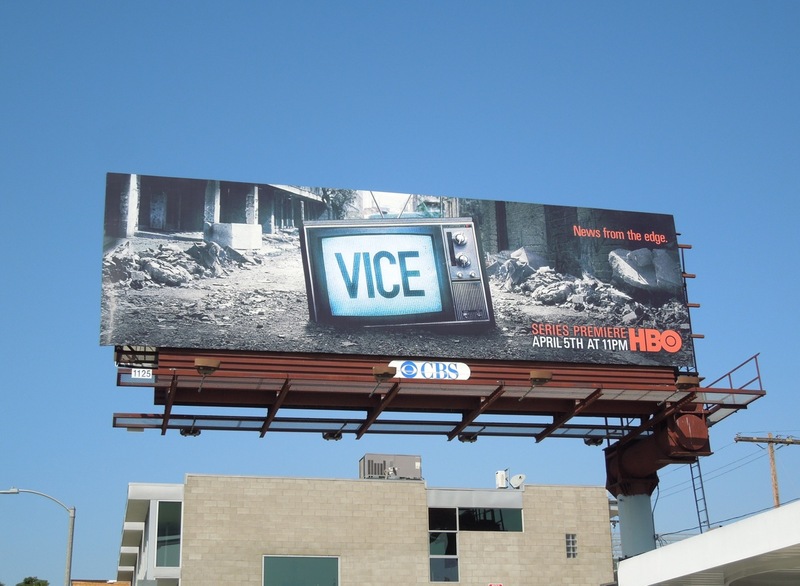 An old-fashioned television set in a bombed out street is certainly a great visual to hint at what's in store from the documentary show which ambitiously touts a fearless approach to uncovering the scariest, weirdest and most absurd happenings known to the human race. 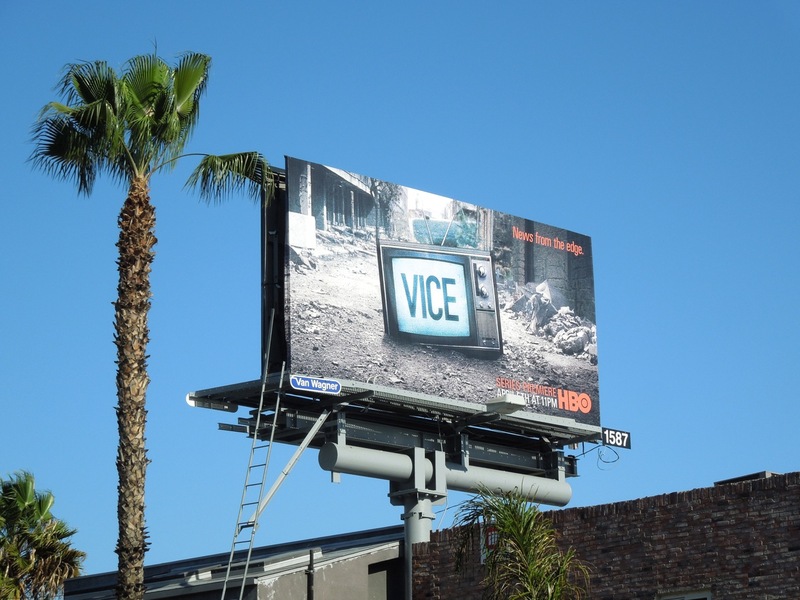 Expect stories on child suicide bombers, political assassinations, forced labour camps, black market transplant organ sales and more unexpected and unconventional news coverage besides. 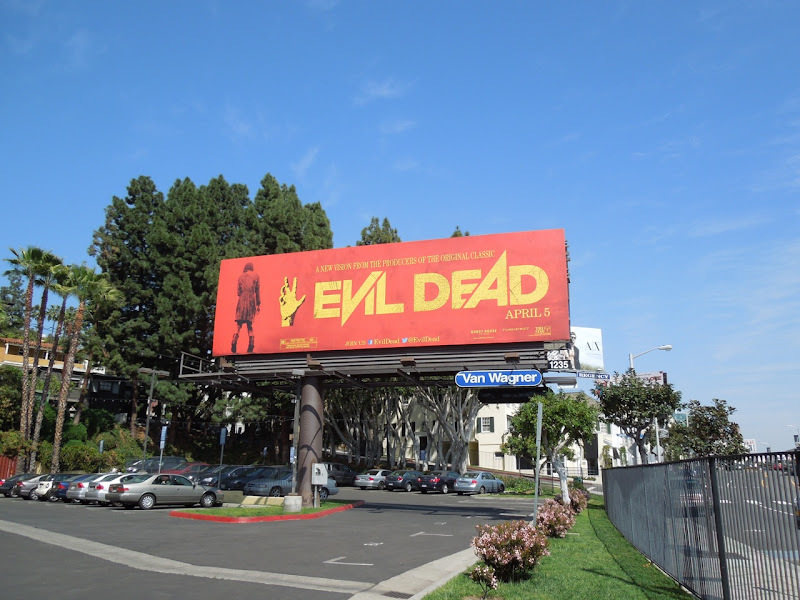 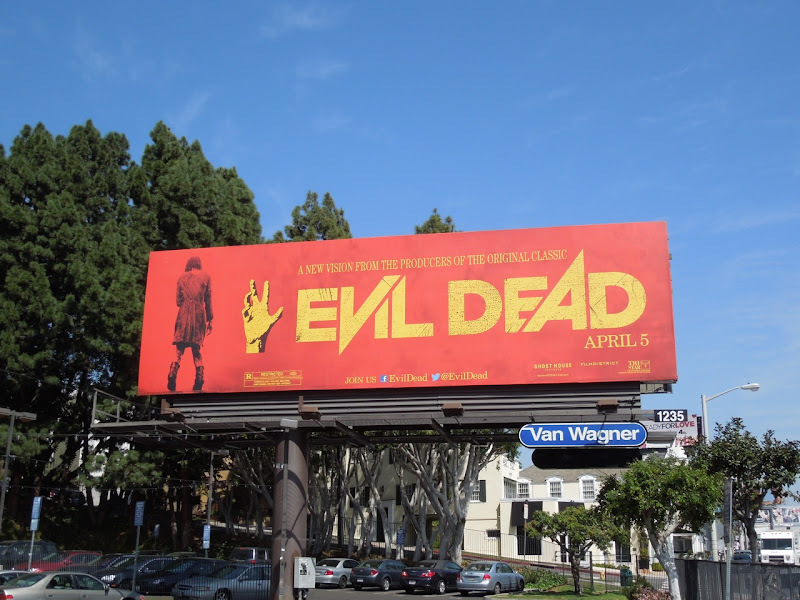 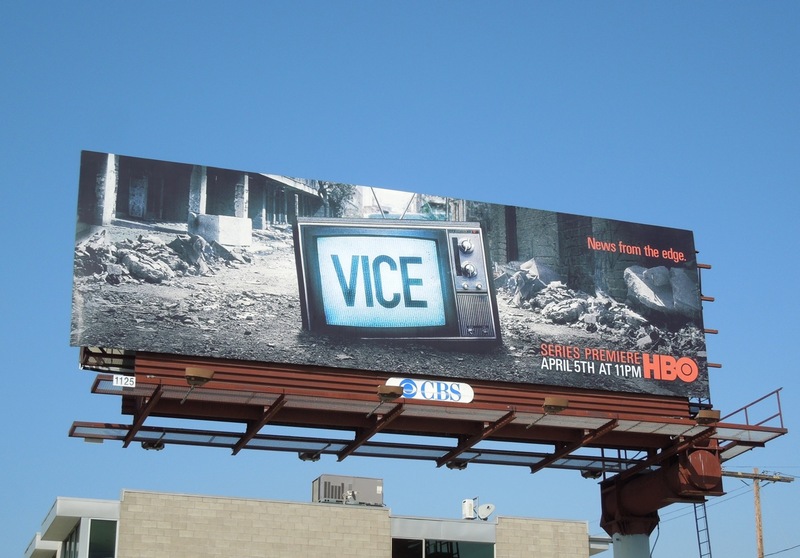 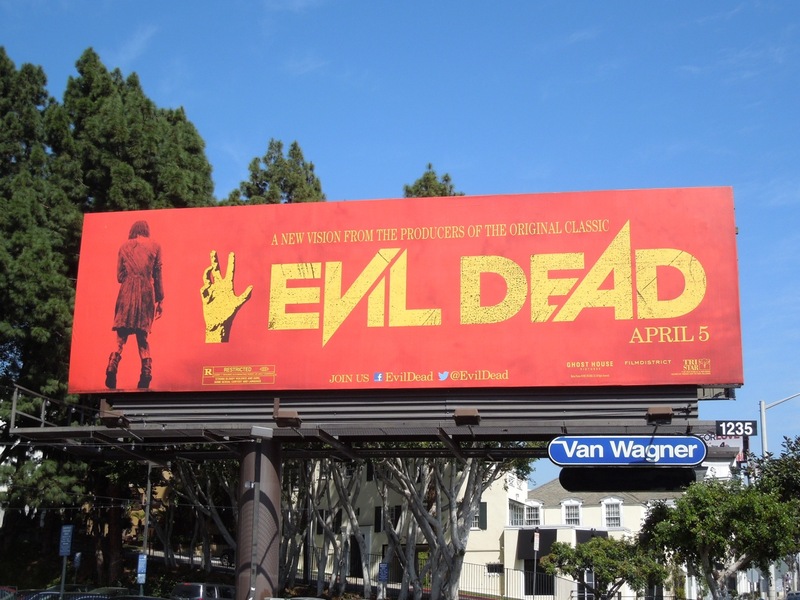 These eye-catching billboards (which have a great colour palette) for the new series were spied along Sunset Boulevard on March 9 and Melrose Avenue on March 22, 2013. 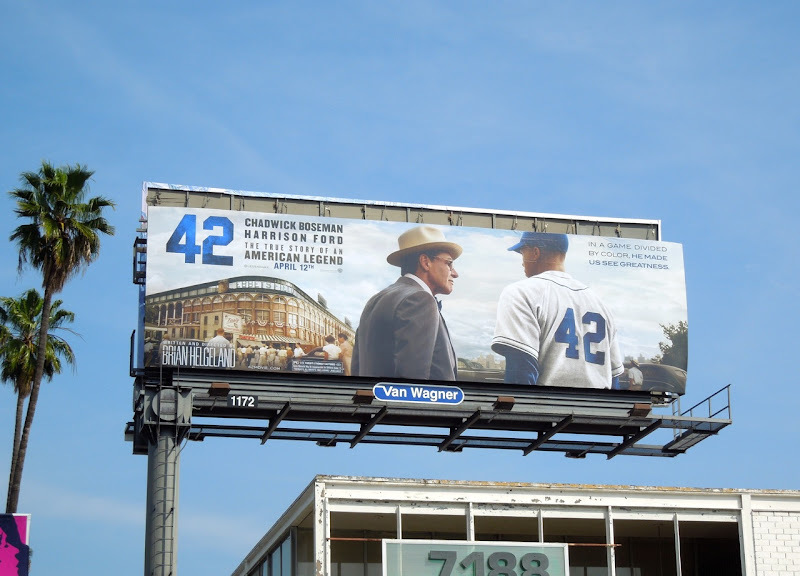 42 joins the proud Hollywood legacy of films with numbers as their titles, like 10, 21, 54 and 300, to name but a few. 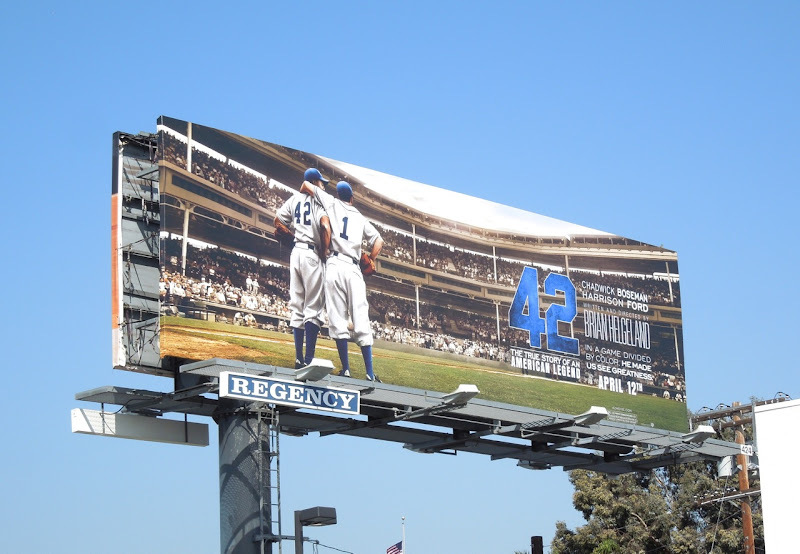 In this instance the 42 refers to the uniform number worn by baseball legend 'Jackie Robinson'. 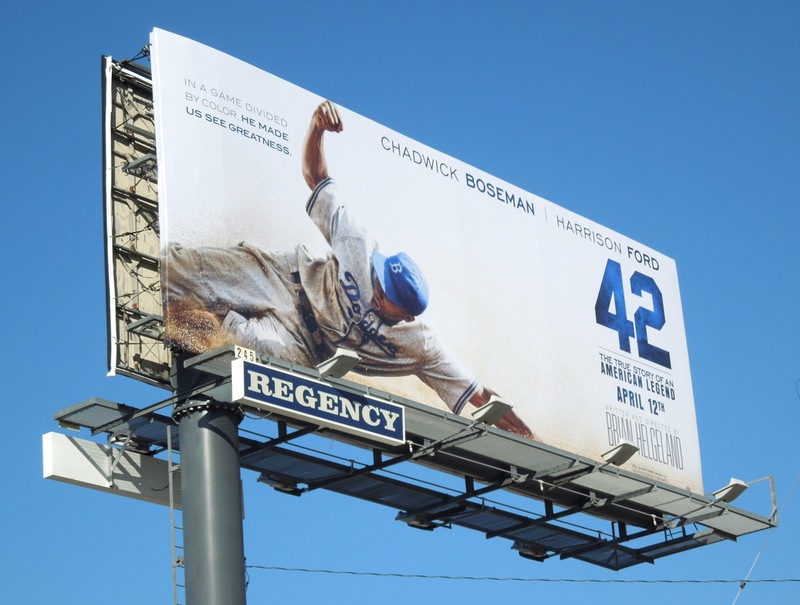 Chadwick Boseman stars in this biopic of the history-making tale of how Jackie Robinson started his exceptional career and became the first African American to play for the Brooklyn Dodgers in April 1947. 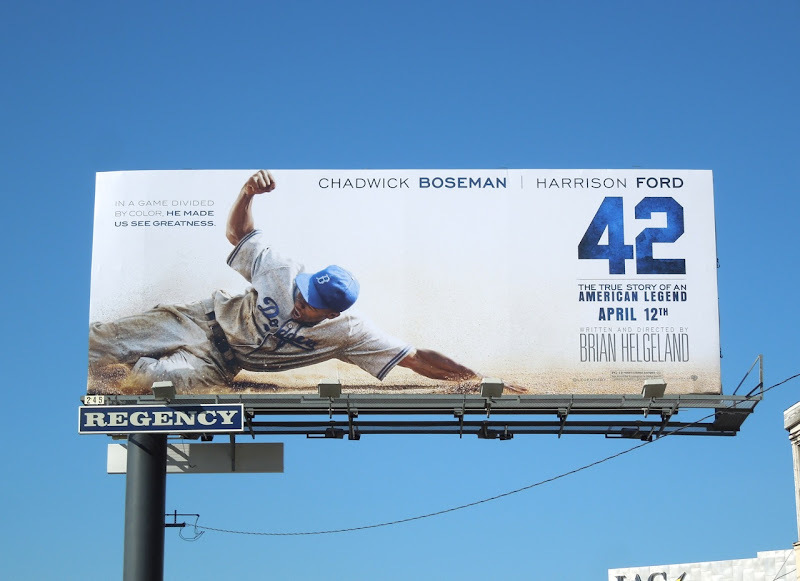 His signing ended sixty years of racial segregation in the sport, under the guidance of team executive 'Branch Rickey' (Harrison Ford). 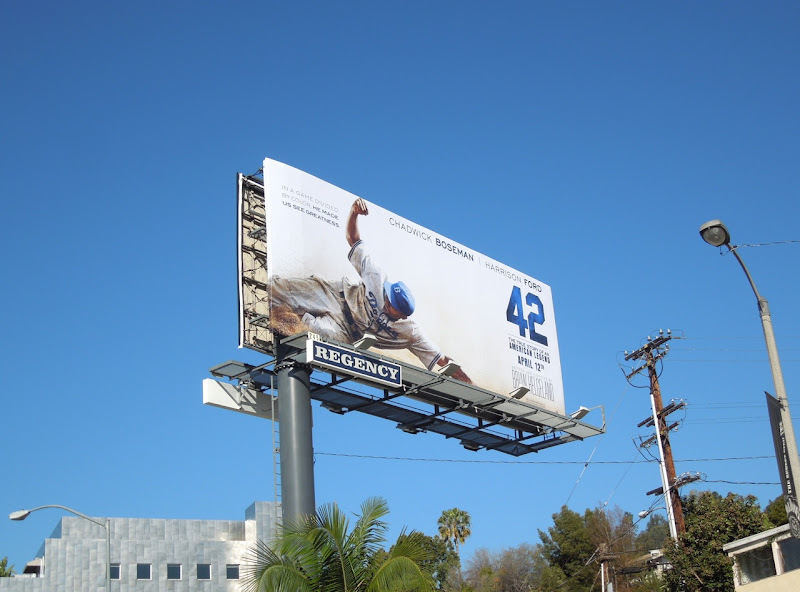 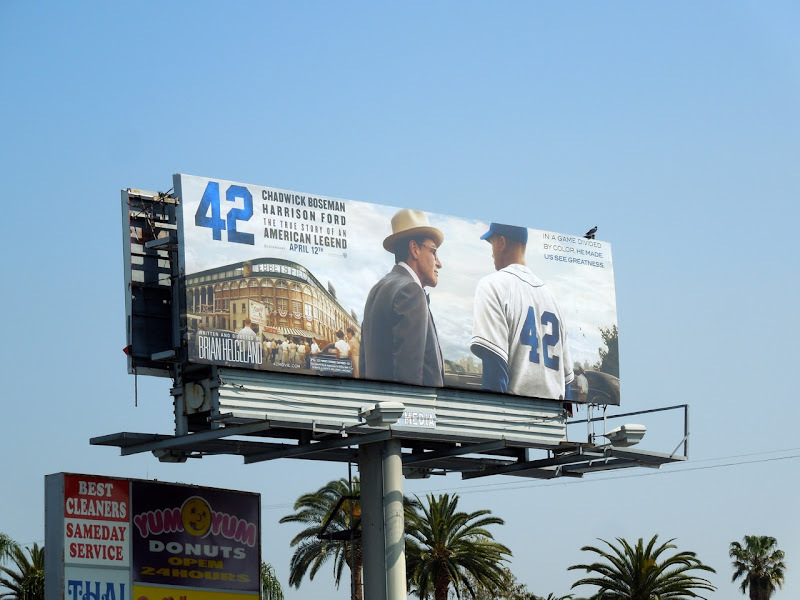 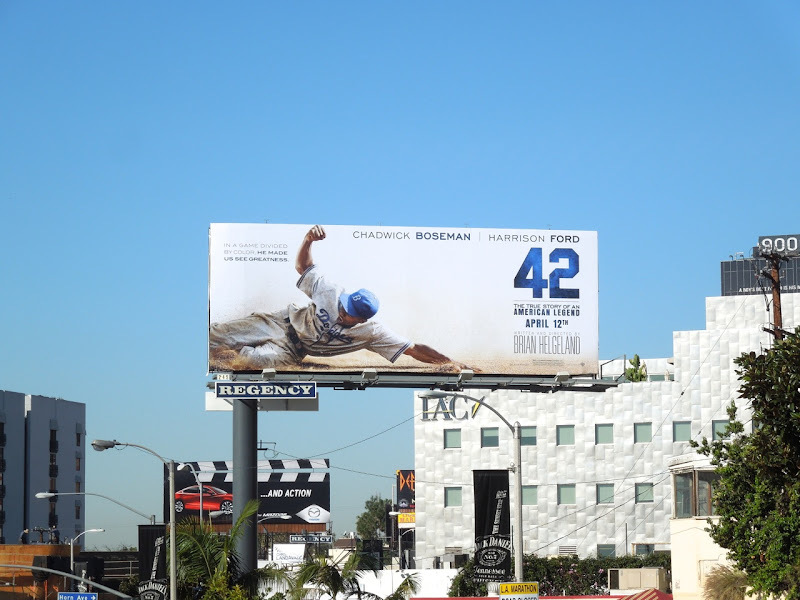 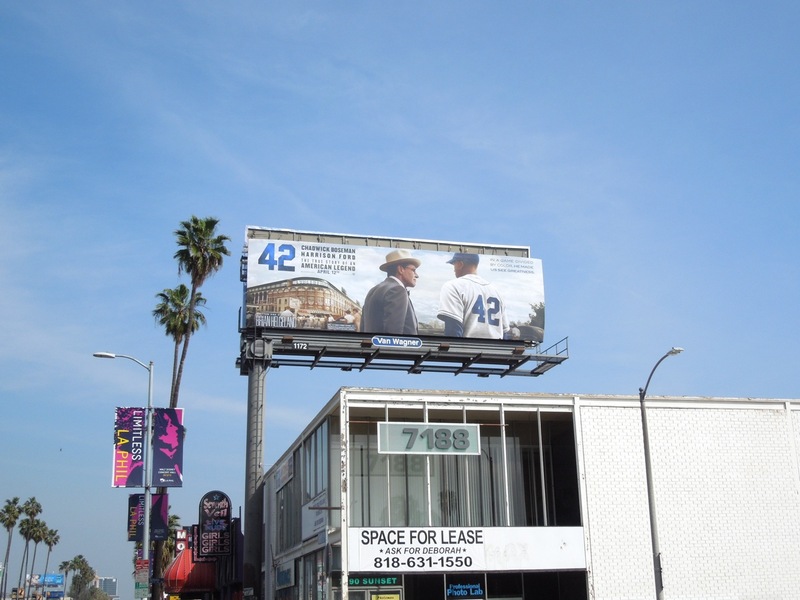 These suitably sporty creatives for the historical baseball movie were spotted lining the streets of L.A., including Sunset Boulevard, Melrose Avenue and Highland Avenue, from March 12 to March 22. For more baseball-themed films, be sure to check out these Trouble with the Curve billboards and Moneyball movie billboards.